PROFESSIONAL BLUETOOTH : Designed for Crystal Clear Voice Communication with High Definition Sound & Noise Cancellation with CSR V4.0 + HSP, HFP, A2DP, AVRCP and A2DP profiles. Built with CVC Technology. VOICE COMPANION: The headset automatically wakes, connects, answers and ends a call. Safely take calls whilst driving; 6.0 hours talk time and about 260 hours standby time. 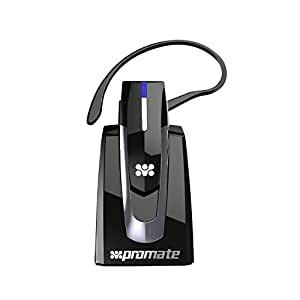 DUAL PAIRING: Blue Gear is a multifunctional wireless headset with docking station which can connect to two devices simultaneously. CHARGING DOCK : With futuristic and innovatively designed charging dock, it includes a convenient car air conditioning vent clip and a dash clip for better placement AND charging on the go inside the car. SUPER COMPATIBLE: Works with all phones and tablets that are Bluetooth enabled- Apple, Samsung, BlackBerry, HTC, Huawei, LG, Motorola, Microsoft, Nokia, Windows Phone, Sharp, Sony etc. Features advanced Bluetooth 4.0 technology, lowest power consumption and super fast pairing to all blue tooth enabled phones and tablets. The headset also sits on a docking station for a stable charging input. Additionally it includes a convenient car air conditioning vent clip and a dash clip for a better placement inside the car. Engineered for professionals that require the most demanding communication features such noise and echo cancellation. CVC brings advanced audio enhancements and noise suppression to the near and far end, as well as providing packet loss and bit error concealment to deliver the best possible call quality on Bluetooth headsets, handsets, hands-free devices, and automotive. When the headset is paired with an iPhone, the power level of the Bluetooth headset automatically appears in the upper right area of the phone screen. Pairs with up to 2 Bluetooth devices at once, you can take both personal and work calls.